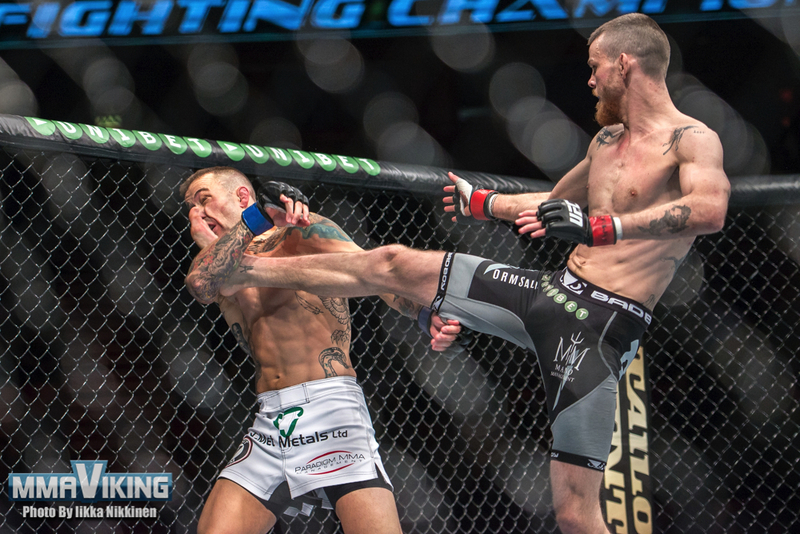 2015’s first update of MMA Viking’s Official Nordic MMA rankings are here. We have taken into consideration all recent events including UFC, Bellator, Cage, Fight Night Finland, Trophy, Cage Warriors, IRFA, Superior Challenge, Invicta, and other shows with Nordic fighters. For the first time, this release includes weight-by-weight rankings of both men and women. Dropped out: Christian Colombo and Christian Golcic due to more than one year of inactivity. SUMMARY: The Nordic heavyweight division is still thin in terms of the number of active fighters. While we also track with Estonian MMA with the rising Denis Smoldarev (10-1-0), the Nordic big men are few. Yosef Ali Mohammad takes the lead even though he hasn’t fought since May of 2014 when he submitted Englishman Mike Neun in 1 minute at Superior Challenge 10. The gigantic Mohammed is exceptionally athletic for a man of his size; this alone makes him one of the most interesting prospects in the Nordics, all weightclasses considered. The Swede will be entering the Inoki Genome Fight (IGF) Grand Prix heavyweight tournament to decide the new champion of their vacant heavyweight title. Marcus “Caveman” Vänttinen experienced a rough welcome to the heavyweight division at Cage 29 where the Finn was stopped via 3rd round TKO by the “Man Mountain” Jarjis Danho at Cage 29. Denmark’s Nick Barno has started his pro career with two stoppages. In February, Barno had his most recent win as he stopped England’s Rob Beech with strikes in the second round at GWFC 1 event. Dropped out: Marcus Vänttinen, due to move to heavyweight. SUMMARY: Sweden’s Alex “the Mauler” Gustafsson is still the man in the light heavyweight division. Although things didn’t go his way in the Anthony “Rumble” Johnson bout in Janauary, where he was stopped in the first round, the Allstars Training Center fighter is still in the top 3 or 4 in the world. He should be back in action for the summer as he tries to get that title shot again. 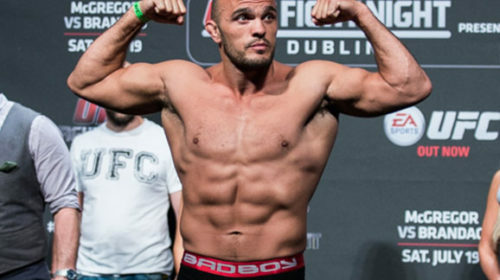 Sweden’s Ilir Latifi was stopped quickly against Polish fighter Jan Blachowicz at the UFC Sweden III in October. While this stopped his two fight winning streak in the Octagon, the light heavyweight powerhouse should be back in the Octagon shortly as he currently has plans to announce his next bout. Danish BJJ black belt Joachim Christensen won a hard fought decision over Sweden’s Matti Mäkelä at Superior Challenge 10. Look for the Dane to return when Superior Challenge returns this May. Matti Mäkelä hasn’t been in battle since his close bout with #4 ranked Christensen back in May of 2014. “King Karl” Albrektsson is on the rise here as he breaks through to a top 5 spot. The undefeated Pancrase Gym fighter is only 21 years old and should be back in action at IRFA in April. 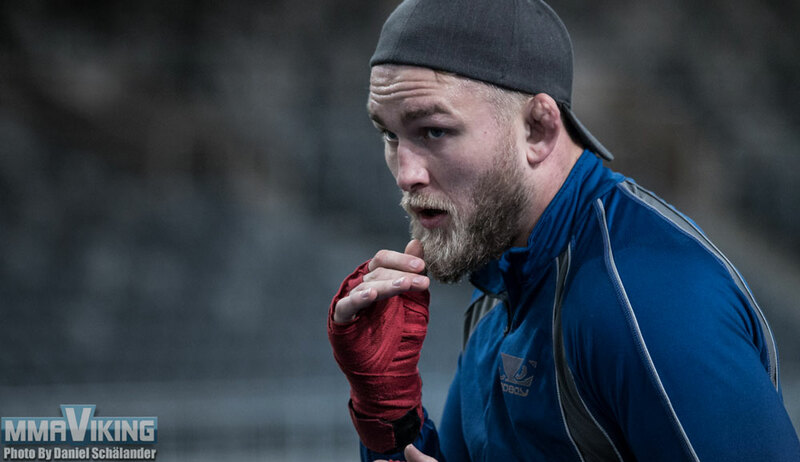 Look for Albrektsson, who has been training with Josh Barnett in the USA, to take on tougher competition and gain more attention as a fighter with unlimited potential. Dropped out: Tor Troeng (Swe) due to retirement. SUMMARY: The top Nordic middleweight ranking shuffles a bit as longtime mainstays Tor Troeng and Mats Nilsson hang up their gloves for good. 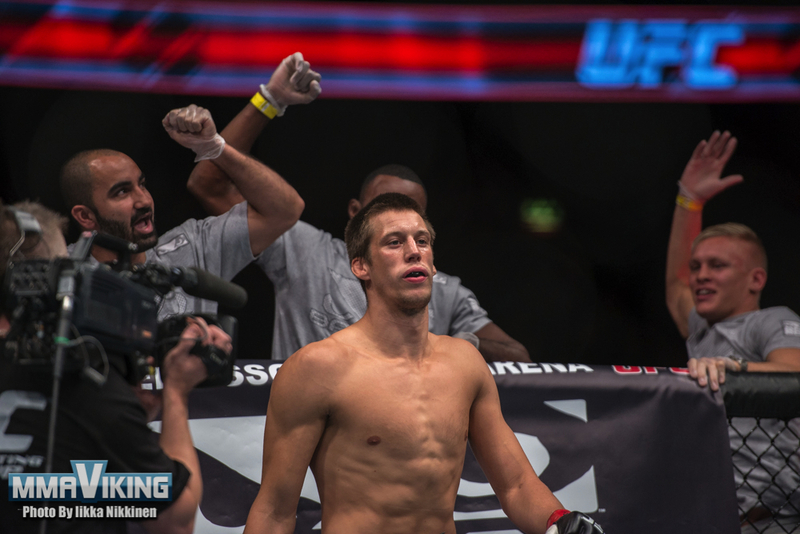 Leader of the pack is Sweden’s Magnus Cedenblad who rides a three fight win streak in the UFC. 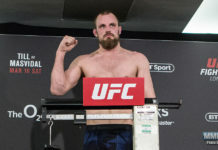 Hulking middleweight Magnus “Jycken” Cedenblad took his third straight UFC win in October 2014 at the UFC event in his hometown of Stockholm. The Swede had to dig deep against a tough Brit, Scott Askham, but in the end it was Cedenblad who got the judges’ nod. He is currently recovering from surgery, so he will likely be back in the third or fourth quarter of the year. Danish tank Mikkel Parlo last fight was at Bellator 115 back in April. The Dane dominated American Johnny Cisneros for three rounds and took home a clear cut decision victory. Parlo, however, had knee surgery, but is currently targeting a bout later in the year. Swede Jack Hermansson, who trains in Norway at Frontline Academy, is on a meteoric rise and goes straight to third spot. After an unsuccessful stint at Bellator, Hermansson has stepped up his game and gone 4-0 in 2014 in Cage Warriors. In June he took the Cage Warriors welterweight belt with a quality win over tough Frenchman Norman Paraisy. In August Hermansson defended his belt successfully and knocked out Bulgarian challenger Deyan Topalski in the first round at Cage Warriors 71. With Cage Warriors’ future uncertain, time will tell when and where we see the “Joker” again. Max Nunes is putting together his skills and potential as he shows he could soon be ready for a shot in the UFC. “Power” dominated veteran Patrick Vallee at Superior Challenge 11, and will be facing Shamil Abdulkhalikov from Russia that has a 10 win and 3 loss record at Abu Dhabi Warriors 2 later in the month. Alan Carlos had a breakout performance at Superior Challenge 10, where he KO’d Daniel Acacio. 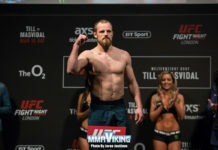 Coming off a loss to Allan Love by submission a year prior, the most recent performance showed that we aren’t sure what we will get in a “Brazilian Viking” bout. Dropped out: Mats Nilsson due to retirement. SUMMARY: The Nordic welterweight division is getting stronger and deeper all the time with hungry young prospects emerging from every Nordic country. 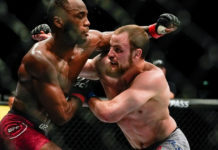 Icelandic phenom Gunnar Nelson‘s undefeated run came to an end at UFC Sweden III where he battled American Rick Story over 25 minutes to a split decision. With “Horror’s” win over current champ Johny Hendricks in his back pocket, it doesn’t look too bad on “Gunni’s” resume. Nelson is targeting a July return, so we won’t have to wait long to see how he has responded to his first defeat. Sweden’s Nico Musoke dropped a hard fought decision to Albert Tumenov in January at the Tele2 Arena. With a 3 win and 2 loss record in the Octagon, Musoke is battling top 15 fighters in the world and improving each fight. Denmark’s Nicolas Dalby is still perfect in his career with 13 wins on his resume. 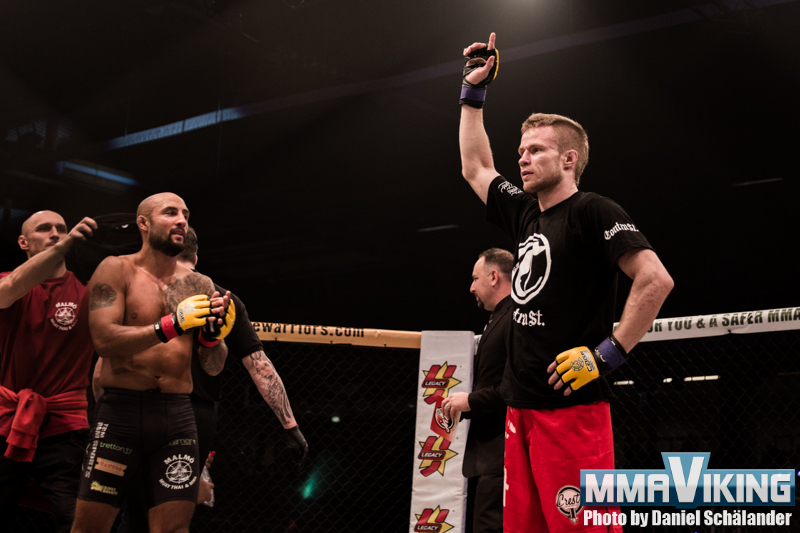 Quickly one of Cage Warriors’ biggest stars, the belt holder had a buzzworthy headkick KO over Sergei Churilov back in March, then in his most recent outing he outpointed Norwegian Mohsen Bahari to notch another solid victory into his golden belt. David Bielkheden has put together a three fight winning streak late in his career. The 35 year old was last in the cage in November, where he locked on a sweet kneebar against Florent Betorangal with just one second left in round 2. Glenn Sparv has won six out of seven fights and enters the top 5 rankings for the first time. “Teddy Bear” has notched two wins since the last ranking update, including an impressive display of grappling against up-and-coming Johan Vänttinen back at Cage 28 in November. 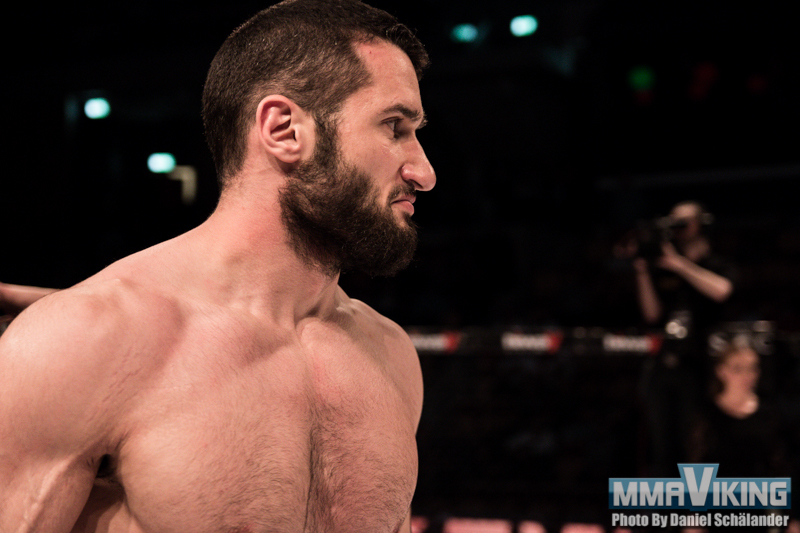 Dropped out: Ayub Tashkilot (Den), Reza Madadi (Swe), Ott Tõnissaar (Est) due to one year of inactivity. SUMMARY: The Nordic lightweight division is going through a shake-up with many of the top fighters missing in action or suffering losses. 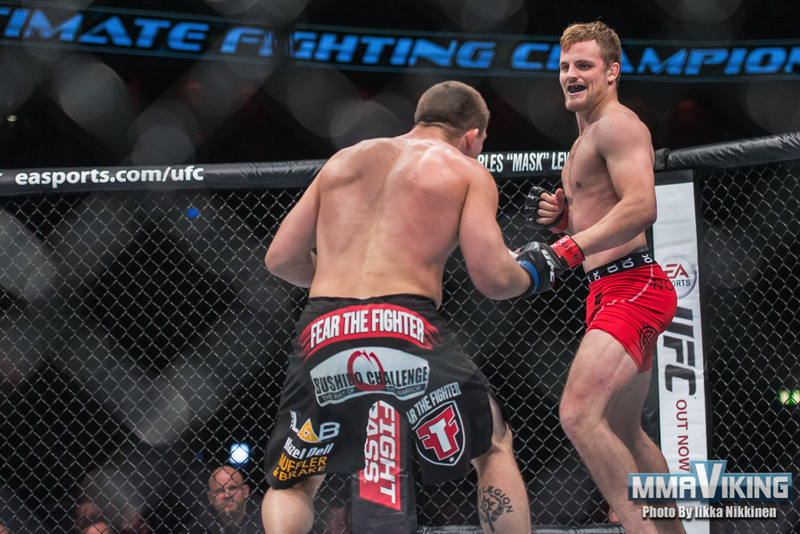 UFC vet Anton Kuivanen gets back on track with his recent win over Sergej Grecicho at Cage 29, rebounding from a flash knockout loss to high-level American Dakota Cochrane at Helsinki Fight Night back in June. Denmark’s Damir Hadzovic, who just entered our rankings in April, rises to the second spot. The Bosnian Bomber scored another solid win in the Cage Warriors promotion when he won a decision over previously undefeated Scottish fighter Martin Delay at Cage Warriors 69 in July. Before that Hadzovic knocked out UFC vet John Maguire at Cage Warriors 66. Finland’s Teemu Packalen enters rankings with a clean 5-0 record. FinnFighters Gym’s grappling ace has finished all of his opponents so far, and four of them in the first round. Fernando Gonzalez took a decision win over a tough Roberto Pastuch at Superior Challenge 11 in November. The 23 year old only had one fight in 2014, so look for more from the newly ranked fighter that is developing out of the cage quickly at Allstars Training Center. Antti Virtanen is on a three fight winning streak. The Finn out of MMA Imatra stopped the powerful grappling Swede Jonathan Svensson at Carelia Fight 10 in the first round to grab the #5 ranking. Dropped out: Akira Corassani due to retirement. Greger Forsell due to inactivity. 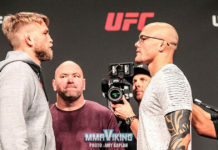 SUMMARY: The featherweight division will flush itself out as the Swedish and Finnish fighters take more fights early in the year, as the rankings for the top four fighters will be re-shuffled with wins and losses quickly. Niklas Backström takes the lead of the featherweight pack with an impressive submission win over Finland’s Tom Niinimäki at UFC Berlin back May. The Allstars Training Center fighter was caught with a huge punch from Mike Wilkinson in October, putting the first blemish on the Swede’s career. Sweden’s Martin Svensson has climbed the ranks with a solid decision win over England’s Dave Hill at Cage Warriors 71. Tom Niinimäki‘s future is unclear, but it is decided that his next fight won’t be in the UFC as he went on a three fight slide. On the merits of his solid win over Rani Yahya in his UFC debut and 12 fight winning streak prior, Stoneface holds on to his #3 spot. Makwan Amirkhani shocked the World MMA community with his 8 second win at the Tele2 Arena this past January, jumping him into the #4 spot in the rankings. The win over Andy Ogle put him on the map, and showed that he is a star on the rise. Look for “Mr. Finland” to get another fight in the summer and climb the rankings with another win. Finland’s Joni Salovaara looked sharp at Cage Challenger event in Tampere where the Finn scored a headkick knock out over Frenchman Nicolas Joannes. The #5 ranked fighter could have added to his resume with his November bout at Cage 28, but a knee to the groin of his opponent put a no contest on his record. Dropped out: David Haggström due to one year inactivity. SUMMARY: The bantamweight top five is a competitive bunch with the top three being potential UFC fighters in the very near future. There’s also good amount of potential in the contender section. Finland’s Toni Tauru moves up to the #1 spot with his belt-winning performance over Englishman Cory Tait at Cage Warriors 72 in September. Recovering from surgery, we haven’t seen TNT for a while, but we can’t wait for his return to see if he can continue his impressive 10 fight winning streak. Three time ADCC Euro champ Tipi Hirvikangas drops to the #2 in the rankings, but it is razor close, as the Finn needs only a high profile win to get the #1 spot and likely earn himself a UFC contract. The skilled Finn is riding a five fight win streak and will face James Pennington at Fight Night Finland in Turku on April 25th. Sirwan Kakai remains at the #3 spot, that doesn’t mean he is far from a UFC deal himself. “Zohan” at 25 years old won at Titan FC 31 in October over American wrestler Joe Barajas to kick-start a new winning streak at two. Finland’s Janne Elonen-Kulmala extended his winning streak to six consecutive victories at LFN 10 where he beat tough Ukranian Vitali Branchuk by decision back in May. Mika Hämäläinen enters the rankings at #5. The GB Gym fighter has had a solid run of six wins and one loss, with his only blemish coming from a submission loss back at Helsinki Fight Night over a tough Murad Zeinulabidov. 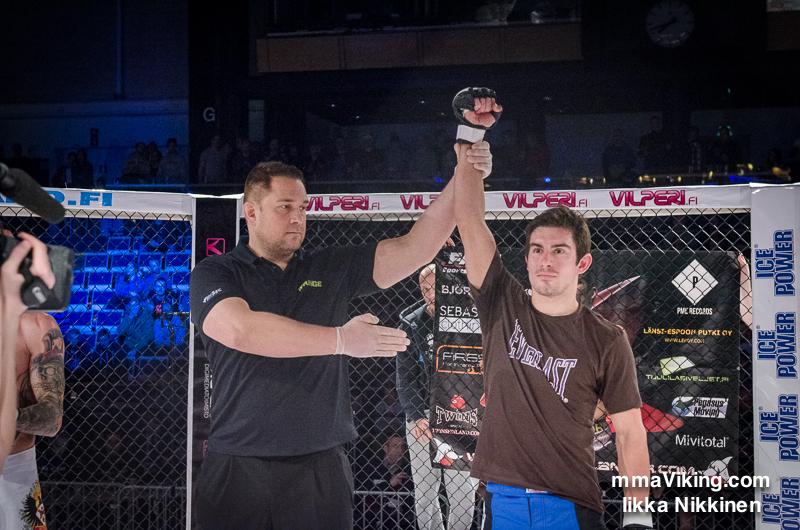 SUMMARY : Finnish flyweight prospect Mikael “Hulk” Silander took his 4th straight win at Cage Challenger 3 where he submitted Bulgarian Dimitar Kostov with a standing guillotine choke in the second round. Sweden’s Bilal Musa enters the flyweight rankings with a decision win over Englishman Craig Derbyshire at Superior 10. SUMMARY : Finland’s Katja “Killer Bunny” Kankaanpää is the number one ranked Strawweight in the Nordics and among the best in the world. She captured the Invicta title over American Stephanie Eggink in early September in dramatic fashion with a submission to win the coveted title. The Botnia Punishment fighter just re-signed with Invicta FC and will defend her title on April 10 against an undefeated Livia Renata Souza. UFC fighter Tina “Jellybean” Lähdemäki suffered her first defeat in her UFC debut at UFC Fight Night 45 in July. The Finn put on a fantastic performance against Claudia Gadelha but in the end it was a clear cut decision win for the Brazilian. The bout between the two was the first ever strawweight fight in the UFC. The Finn has had multiple surgeries, so won’t be back in action soon. Iman Darabi is a BJJ Purple Belt that is looking to make a successful transition into MMA. The natural Atomweight is only finding fights at the Strawweight division, but has faired well so far. 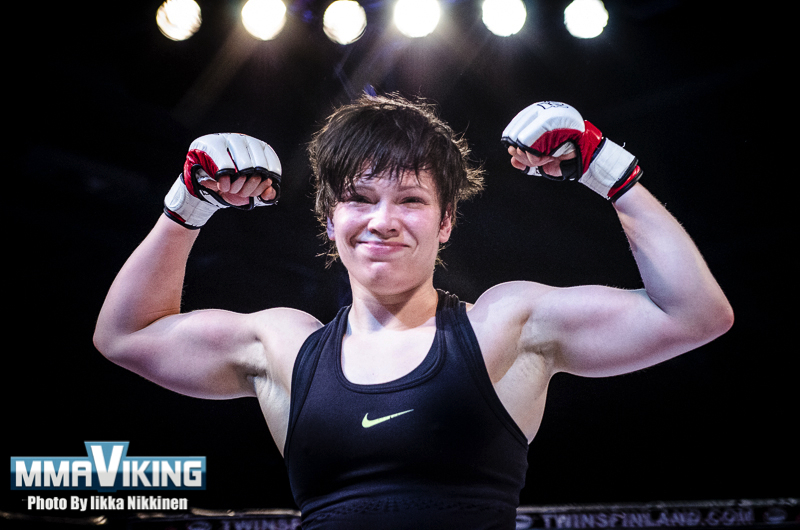 Darabi decisioned Finn Veera Nykanen at IRFA 6 in April, but her IRFA 7 bout was cancelled. The Kurdish and Swedish pro trains out of Pancrase Gym in Stockholm and is hoping to get booked for a fight soon. Celine Haga is from Norway, but has become a staple on Jewel cards in Japan. Training out of Jackson’s MMA in New Mexico, the 30 year old has won her last 5 of 6 bouts. 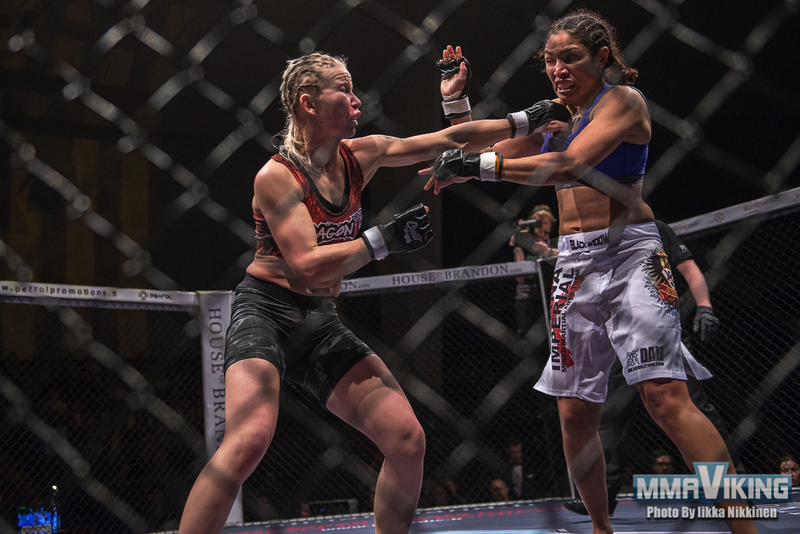 Veera Nykanen is new to the MMA scene, as her only pro fight took place last April against Iman Darabi. Her planned pro debut at Cage Warriors 64 in February turned into an amateur fight when her opponent didn’t make weight. Dropped out: Lina Eklund due to more than one year of inactivity. SUMMARY : MMA UTTI fighter Suvi Salmimies beat a true veteran in Karla Benitez at Cage 29 by majority decision and moves into the #1 spot. Look for the improving Finn to be up again at Cage 30 to show her ever evolving game. Linn Wennergren didn’t have any bouts in 2014, and the most latest was due to in injury that kept her out of heading to Brazil in November for a bout with XFCi. La Machine’s only loss it to Tina Lahdemaki. The 29 year old’s last bout was beatdown of Angelica Babbi at Superior Challenge 9 back in November of 2013 in Gothenburg. After some re-hab the Swede is seeking a new bout, so she remains in the rankings even with the inactivity. Vuokko Katainen had a win, loss, and draw in 2014 for a mixed year. The MMA Kuopio fighter was last in action at XFC International 6, where she lost a majority decision to Antonia Silvaneide da silva. Now the Finn will drop to strawweight for the next rankings, as she plans her debut on March 15 at XFCI versus Dora Perjes. SUMMARY : Undefeated Pannie “Banzai” Kianzad has shown that she is among the best in the world with her undefeated run. Kianzad was victorious in May at Superior Challenge 10 where she took home a decision win over Italian Annalisa Bucci. In August the Rumble Sports fighter beat Holland’s Megan van Houtum at Cage Warriors 71 by TKO in the 3rd round. In November, she captured Cage Warriors gold by decisioning Eeeva Siiskonen over 5 rounds as she hit the scales at 135lbs. 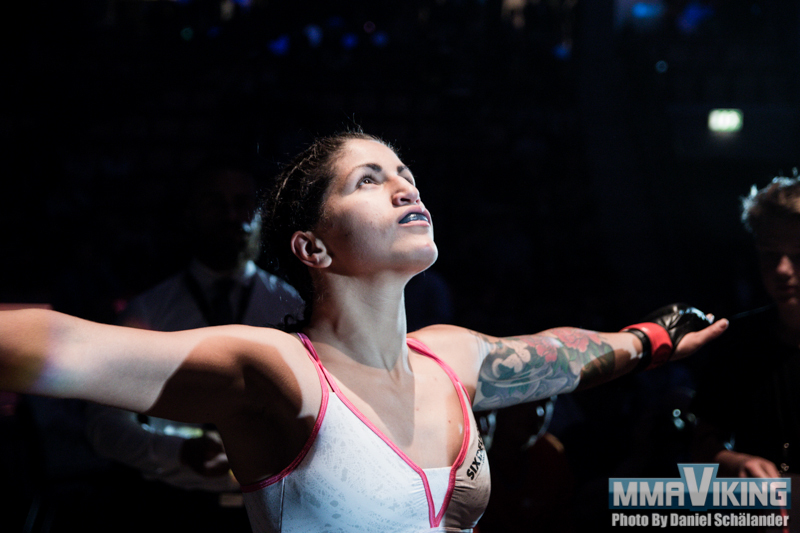 She tops the weight class, and shouldn’t be too long before we see her in the Octagon. 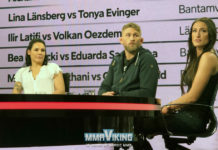 Lina Akhtar Länsbarg is ranked second in the division, and put on a vicious beatdown in her last outing with a first round TKO win over England’s Laura Howarth at Cage Warriors 71. Out of Malmo Muay Thai and MMA, the 32 year old striker is dangerous and will head into her next bout on a three fight winning streak. Her only loss is to the Kianzad, which took place back in 2012. Eeva Siiskonen is in the third spot after dropping her most recent fight against Pannie Kianzad, a bout that she took on short notice. 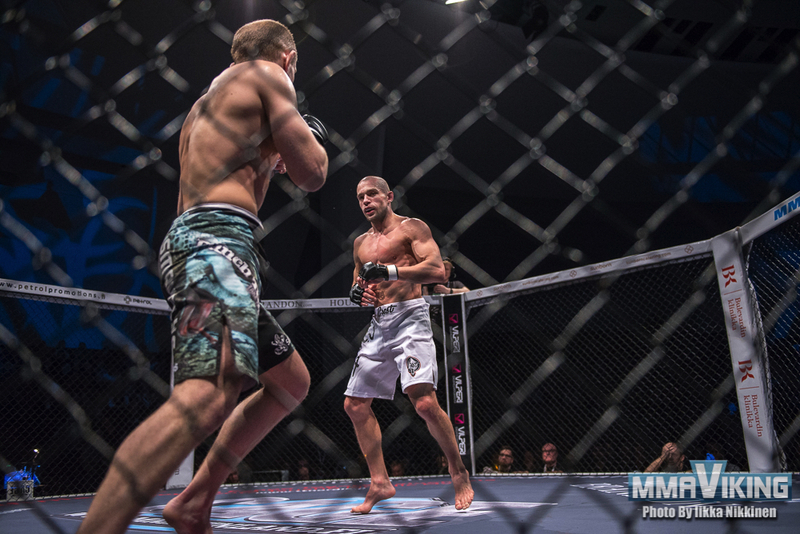 The MMA Imatra fighter showed heart and impressive cardio over five rounds with the late notice matchup. At Carelia Fight 10, the 32 year old beat Inga Kaledaite by KO in the second round. With only 19 seconds of pro MMA, Anna Elmose takes up the last slot. With unlimited potential, it will be interesting to see where Panda can take her career. The striking and power of the Dane is unusual, and anyone on the end of her punches will end up KO’d. Elmose steps back in the cage on March 15 at MMA Gladiators. Dropped out: Elina Nilsson due to more than one year of inactivity. 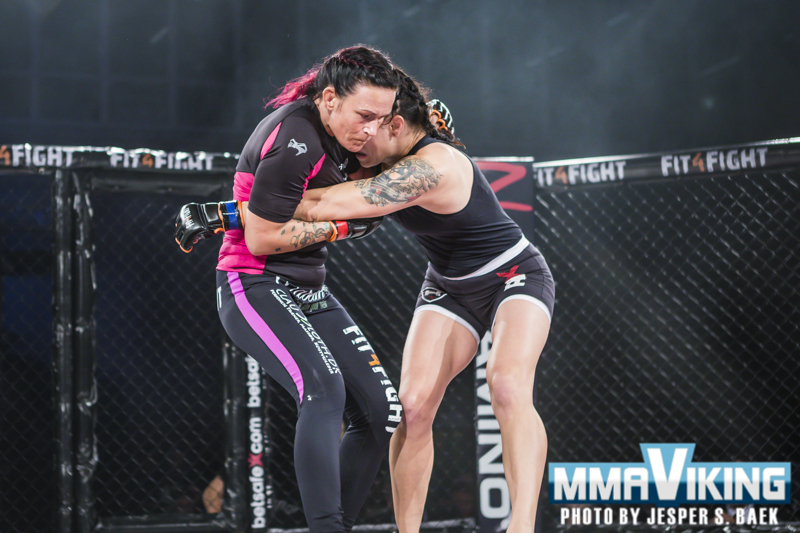 SUMMARY : Denmark’s Maria Hougaard Djursaa is the top ranked featherweight Nordic fighter. Coming off a three fight winning streak over 2011 – 2013, she lost a decision in a close bout to Italian Annalisa Bucci at EMMA 9 and most recently was stopped by Amanda Bell in her Invicta debut in November. Look for the Dane to return to action for another Invicta bout. Djursaa Signed to Invicta is the the Top Nordic at 145 lbs.